Pricing for the 2019 Genesis G70 lineup has been revealed, and as predicted the model significantly undercuts its luxury sport sedan competitors. The 2019 G70 will start at $35,895 for a rear-drive 2.0T model when it goes on sale this week. That amount of money gets you a turbocharged 2.0-liter I-4 making 252 hp and 260 lb-ft of torque mated to an eight-speed automatic transmission with paddle shifters. It also gets you an impressive list of standard features, including hands-free keyless entry and push-button start, dual-zone climate control, a 60/40 split folding rear seat, 8.0-inch touchscreen infotainment system with Apple CarPlay and Android Auto compatibility, forward collision warning with automatic braking, adaptive cruise control, lane keep assist, blind-spot warning, rear cross-traffic alert, automatic high beams, and more. To get a comparably equipped BMW 3 Series you'd have to pay at least $10 grand more. The 2.0T is available in six trim levels, including Advanced, Elite, Prestige, Dynamic, Sport, and Sport M/T, which starts at $38,895 and gets you a six-speed manual transmission and an extra 3 hp. That model gets a more performance-focused equipment list that includes a multi-plate limited-slip differential, Brembo brakes with performance pads, a sport exhaust system, and 19-inch alloy wheels wearing Michelin PS4 summer tires. The Sport M/T is only available in rear-drive form. On all other models, all-wheel drive is a $2,000 option—except on the $45,895 2.0T Prestige where it comes standard. Though they both have "Sport" in the name, the Sport M/T and automatic-equipped Sport are very different trims. The 2.0T Sport builds on the Prestige model, offering a head-up display, a wireless charging pad, 360-degree camera, quilted Nappa leather seats, and a Dinamica microfiber headliner, among other premium features. That helps explain why it starts $7,000 more than the Sport M/T at $45,895. A Genesis rep told us the Sport M/T is positioned as the "purist's" version, meant to appeal to enthusiasts with its minimalist features list that doesn't even offer a sunroof. If you want the twin-turbo 3.3-liter V-6 that makes 365 hp and 376 lb-ft, you'll need to pay at least $44,745. That price gets you a 3.3T Advanced model, which builds on the 2.0T Advanced's standard features with a dual exhaust system, sport-tuned suspension, Brembo brakes, onboard navigation, full LED headlights, heated and cooled leather seats, and a Lexicon 15-speaker audio system. The 3.3T is available in four trims, and all come standard with a limited-slip differential. The 3.3T Prestige starts at $48,995 and adds a head-up display, quilted Nappa leather seats, Dinamica headliner, heated rear seats, and a 360-degree camera. Topping the range is the 3.3T Sport, which gets an adaptive suspension, copper and dark chrome exterior accents, and 19-inch alloys for $50,495. That's just slightly more than what the mechanically similar but larger Kia Stinger tops out at. Genesis is also offering two limited-production models at launch: the Design Special Edition and Dynamic Special Edition. Each will be limited to 400 units, and will pack the twin-turbo 3.3-liter V-6 along with unique styling and a high level of equipment. The Design Edition is based on the 3.3T Prestige, but adds an exclusive Black Forest Green exterior paint scheme, a contrasting cream and dark green interior theme, and a steering wheel wrapped in Pasubio leather. The Dynamic Edition is based on the 3.3T Sport, but adds Michelin Pilot Sport 4S summer tires, performance brake pads, unique tuning for the adaptive suspension, upgraded cooling, and a lightweight tire repair kit to replace the spare. The Design Edition starts at $49,745 while the Dynamic Edition starts at $51,245. As with the rest of the lineup, all-wheel drive is available for an extra $2,000. 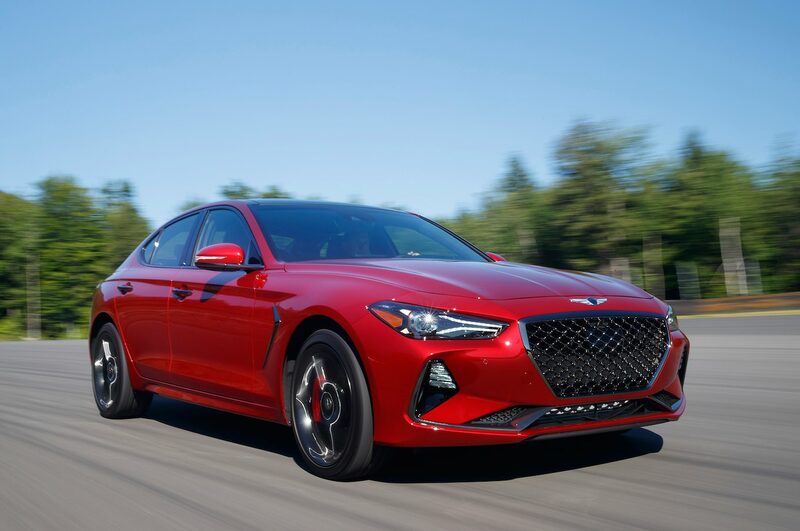 As a fledgling brand, Genesis has to try harder to stand out in the crowded luxury segment, and the Genesis G70 does just that by offering a premium, sporty driving experience at a very competitive price. Only time will tell if the G70 can lure buyers away from established brands like BMW, Mercedes, Audi, Lexus, and Infiniti.